Trigger Point Injections are one of the most effective procedures treats trigger points in the neck pain and lower back pain. These trigger point injections are intramuscular and are safe and effective with no known side-effects. 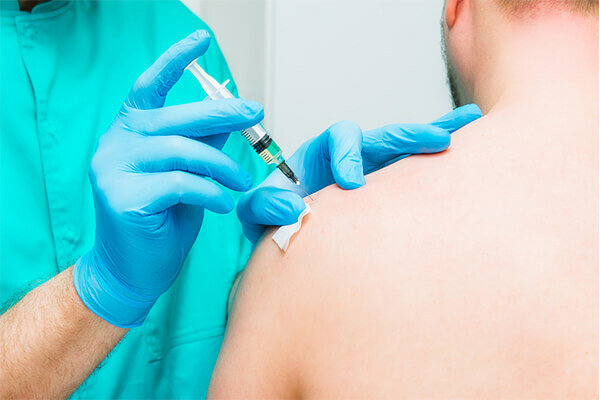 These injections are always performed by our medical doctor or physician assistant. A benefit of this treatment is that it only takes a few minutes. The medication used in trigger point therapy is called Traumeel. This anti-inflammatory is plant-based and non-toxic. Traumeel is a wonderful option compared to similar treatments. Corticosteroids, for example, can produce harmful side effects such as damage or weakening of tendons, cartilage or bones. Our patients who are receiving Traumeel injections are thrilled with the results they achieve. If you or someone you know suffer from trigger points or painful knots, give us a call to see if you would be a candidate for trigger point injection therapy.